Location: 2456 Rayburn House Office Building, Washington, D.C.
MARK KRIKORIAN: Good morning. My name is Mark Krikorian. I’m executive director of the Center for Immigration Studies. We are holding this briefing – we do this at the beginning of each new Congress because it’s – I think it’s helpful, given especially this time with dozens of new members coming in, that we try to offer some context and some numbers to counteract the sentimentality and often, I was going to say untrue, but I’ll be charitable and say, skewed perspective offered by a lot of the special interest groups. In particular, at 10:30, there’s an event by FWD.us, by Zuckerberg’s outfit, which will essentially be negating everything we’re going to be saying here today. So we at least have to try to get to staffers and to offices the numbers on things like workforce, on enforcement and other things that you just don’t usually get otherwise. And that’s what we at the Center for Immigration Studies try to do. We’re a think tank that examines and critiques the impact of immigration on the United States. And we’re really the only organization that does this without a particular ax to grind. We have a view on immigration, a clear one and we’re not coy about it, but we’re not making any money off of this, unlike the various other groups – whether it’s the Chamber of Commerce, whether it’s the tech organizations, whether it’s the immigration lawyers – all of whom have their research arms and some of whom do some useful work. But they’re all making money off of this issue. And we’re not, which is in one sense a sort of a testament to our bad business model, but – (laughter) – part of what we’re trying to do is make a case for an immigration policy in the national interest. And Congressman Mo Brooks from Alabama is going to be introducing – giving some remarks. And then I’ll introduce the other speakers. So, Congressman, if you wanted to say a few words. Do you ever get introduced as Mel Brooks? Does that every happen? REPRESENTATIVE MO BROOKS (R-AL) : Occasionally. Only with people who are confused. MR. KRIKORIAN: There you go. REP. BROOKS: Mark, thank you so much for the opportunity to be here. Steven, Rosemary, I appreciate the work that y’all are doing in this immigration field. One of the challenges we have in Washington is so many of our policy makers have these blinders on. And when you start talking about immigration policy, all they see is the immigrant, and that’s it. They don’t see the impact of immigration on American citizens. And when I talk about the impact on American citizens, I’m talking about the income – family income impact. And so what we have to do is we have to be able to get a lot of our congressmen and senators to take off the blinders so that they can see the whole picture. And if they see the whole picture, then I think we’ve got a chance of being successful in doing what needs to be done for American citizens. But if we keep on those blinders, then there’s going to be hell to pay for American families, because they’re going to suffer. I don’t know how many times in discussing immigration with my fellow congressmen and senators I feel almost like I’m up against a brick wall because all they see, again, is the immigrant. And you got to have compassion for the immigrants and the plights that they’re trying to escape from as they come to the United States of America. If you don’t have that kind of sympathy, well then, quite frankly, you’re somewhat heartless. But what you have to then look at is the impact on American citizens, because if you don’t look at the impact on American citizens, then you’re also heartless because there’s tremendous damage being done. In that vein, I am so thankful for the information that the Center for Immigration Studies is able to provide so that we can look at, with greater understanding, the impact of immigration policy on Americans. And in that vein, I’ll use as an example a report that the Center for Immigration Studies put out last summer. And I read the report. And it was somewhat mind-boggling. And the gist of it was, if you look at the economic picture from January of 2000 to January of 2014, a 14-year period, the American economy created a net gain of 5.6 million jobs for people in the 16-65 age bracket. Sixteen to 65 is a pretty big age bracket. And you’re thinking, OK, well, it’s good to know that our economy is strong enough to create 5.6 million new jobs for people to fill. And then you get into the rest of the report. And of that 5.6 million net new jobs, 5.7 million went to lawful immigrants and illegal aliens, meaning that American citizens – who we’re supposed to be representing; they’re the people who hired us, they’re the people who elected us – they had a net loss of 127,000 jobs over that 14-year period. In addition to that, because of the net job loss for American citizens, coupled with population growth, in that 16 to 65 age bracket, there were 17 million more Americans unemployed today – 16 to 65 – than 14 years ago. And that’s the kind of information that you have to get to the policy makers so that they can take those blinders off and see the full picture. And I’m so thankful that the Center for Immigration Studies does so much work on this particular issue. And I’d be remiss if I did not also add that, with respect to Rosemary Jenks, I’m very thankful for what NumbersUSA does on more of a political level and an information level to help us get the information we need to make the kind of decisions that must be made for our country and for the people who sent us here. But that having all been said, I’m going to touch just a little bit about the legislation that’s pending. Let me be real clear, in my judgment everything we’re doing right now in the House of Representatives is political theater, OK? It’s well-intentioned political theater, but for us to be able to restrain the president’s illegal actions with respect to amnesty and DACA and things of that nature, you have to have the president’s consent with the path that is being taken. If the president vetoes this effort to defund these unconstitutional programs, well then he wins because I don’t know of anybody who would suggest that we had the votes to override that veto. Now, we’re going to go through this exercise in the House and hopefully this week we will pass legislation that will help better protect American citizens from the damage that is being wrought by this huge increase, surge in the labor supply because of our immigration policies. But nonetheless, once we’ve gone through this political theater and it goes to the Senate. If it passes the Senate it goes to the president’s desk. He’s threatened to veto. Where are we once that veto is exercised? In my judgment, the only path that we have in Congress to stop the president’s illegal conduct with respect to immigration is through the judicial system. And the reason I say that is we don’t need the president’s consent to go forward. The House of Representatives – by way of example, House Resolution 11 – if the House of Representatives passes that, then immediate the speaker is authorized to file a declaratory judgment action to determine whether the president’s conduct is in accord with the law and, if not, to seek equitable relief, a writ of mandamus, to compel the president to obey the law. And if the president does not comport or comply with that federal court order, then our next recourse is contempt of the president will all the kinds of sanctions that federal courts have to compel people to obey the law. Now, in that scenario there is no signature of the president needed. So it doesn’t make any difference if the president likes it or dislikes it. He doesn’t have veto authority. All we need are the votes in the House of Representatives. We don’t even need the Senate to go along with this. And it’s a parallel path to what we’re now doing with Obamacare, where we passed legislation authorizing litigation to challenge in court the constitutionality of the president’s Obamacare executive order. So I would submit that that is the path that we ought to get behind because that’s the only one that does not rely on the president’s consent to be successful. There’ll be a third party, the judicial system, that makes the decision on whether we win or lose. But nonetheless, what NumbersUSA is doing, what Center for Immigration Studies is doing and what you are doing by being here today is critical to this process working properly, because information, intellect, having the right information in your hands so that you can make a rational decision is key to making good policy. And that’s what this forum is about. I very much appreciate y’all putting it together. And at this point, if you’ll please forgive me, we’ve got a GOP conference that started a few minutes ago. So I’m going to have to depart, but I do want to wish you the best of luck. And I’m very, very thankful for the information that you give those policy makers because it’s invaluable, at least in my mind, to our making the kind of decisions that the American people expect and deserve. MR. KRIKORIAN: Thank you, Congressman. The – one of our speakers is in a cab still, but she’ll hopefully get here before her turn comes. Our first speaker is going to be Steve Camarota. He’s director of research for the center. He likes to joke that he puts the think in think tank for CIS. (Laughter.) And he’s going to be talking, first, a little bit about kind of the mechanics and numbers and then his forte is the affect that immigration has on the labor market and the whole labor market issue of immigration. So Steve has a PowerPoint that we’re – we just have the slides and paper in the file – I mean, in the folder up there that you can get at the table. And he’ll be talking about that. Steve. Download the Power Point Presentation referenced by Steven A. Camarota. STEVEN CAMAROTA: Well, I appreciate you all coming. And as both Mark and the congressman said, it is designed to be informational. I am going to go from this little PowerPoint. Obviously, you can take it home with you. Our contact information is on there. And I thought that since we would have new folks or folks who may not know the immigration issue all that well, it would be very helpful to have just a very brief overview of what we think is going on in immigration, what are the numbers, where folks come in and that sort of thing. So very briefly, if you look at that first slide, the left side – does everyone have this? If anyone doesn’t have it, Marguerite can just get you one real quick. Marguerite, I think there’s a couple people who don’t have the presentation. And just make it easier, you know, to look at, get the numbers. Again, it’s the one that says: immigrants in the United States, legal and illegal. So that’s what I’m going from. In any event – so, that first slide just gives you an idea of the total foreign born on the left side. So you know, I say up here at the top, why is immigration an issue? Why study it? Why is it important? Well, the first thing you have to understand is at least in the last 40 years, the immigrant population, both legal and illegal, as found in Census Bureau data – the census – you know, we take a census every 10 years. We collect some information. But the Census Bureau also does stuff between the census. But in any event, what it shows is a massive growth. So what – the way you would read this is that in 1970 there were about 9.6 million foreign born. And these are people who are in the country legally or illegally, that is people who are not U.S. citizens at birth. So that would include a small number of visitors, foreign students, but it’s mainly green card holders, naturalized citizens and, of course, folks who are here illegally. And that number, a little less than 10 million, is – in 1970 – is now over 40 million – 41.3 million, so just kind of a massive growth in the legal and illegal populations. So as I point out on the right-hand side, it’s doubled since 1990. It’s nearly tripled since 1980. And it’s quadrupled since 1970. Now, the line shows it as a share of U.S. population. Again, it went from less than 5 percent to over 13 percent. About 16 percent of adults in the United States are immigrants, foreign born, legal and illegal. Now, what share of that 41 million do we think are here illegally? About a 10, 11, 12 million, so roughly a quarter – little more than a quarter. Usually reckoned to be about 28 percent today of the immigrant population in the United States is here illegally. Obviously it varies by country. Of all, say, immigrants from Mexico, about half are here illegally. The same would be true for Central America. But for other countries, it would be a much smaller share. And, again, that’s just based on DHS estimates. And this huge flow of people into our country, of course, has enormous impacts on everything, as I say here, population size, composition of the society, culture, the labor market and the economy, public coffers, people pay taxes and use services, the politics of the United States. So it’s hard to find a kind of public policy issue where immigration doesn’t loom large. Let me just give you a quick example. One of the reasons for the political pressure for Obamacare is the growth in the uninsured population in the United States. We all know that. But the government actually collects data on who’s uninsured, whether they’re immigrants or not and when they came to America. So you can actually calculate pretty easily the share of growth in the uninsured that is new immigrants and their kids. And it turns out, no matter how you calculate it, it’s almost three-quarters of the growth in the uninsured. In a very real sense, our immigration policy is driving or drove the massive increase in the uninsured and, thus, had an enormous impact both on our health care system but also on our politics. That’s just one example. There are numerous others I could give you. One out of every four children in America is a – lives in an immigrant family now. About one out of every three children in poverty in America lives in an immigrant household. So very large effects. So as I say, it’s hard to understate the impact. OK, very briefly, how do folks get here? So some of you may know this, maybe even better than me, but I wanted to give you a quick overview. There’s legal, permanent immigration. It’s about 1.1 million a year. And that’s the so-called green card. It allows you to stay permanently and become a citizen after five years, if you want. About a third of that, or 66 percent, is a family member sponsoring. You marry a foreigner or someone’s – who’s an American citizen sponsors their brother and his family to come. That’s family-based immigration. About 16 percent is employer-based immigration, which is essentially that an employer has sponsored your or that you have some specialized skill that’s thought to be in need. About 13 percent are refugees and asylees. A refugee is someone who we’ve identified overseas as needing permanent resettlement. That process, unfortunately, is pretty political. We don’t tend to take the refugees that the U.N. say always are the ones needing resettlement. We tend to designate people ourselves. And then, of course, there’s asylee. That’s the person who applies in the United States for political asylum. They’re both similar. They’re both part of humanitarian immigration. The idea is that you face persecution based on your race, your religion and so forth. Now, in addition to legal permanent immigration, we have long-term, temporary immigration. These are not people who get green cards, but these are people who come – for foreign students, guest workers, that sort of thing. And you can see the breakdowns here. That’s a lot of guest workers, several hundred-thousand new folks each year. But remember, there’s a lot of churn in that population. Foreign students come and go. Guest workers come and go. But it is also the case that some – a very large fraction of the green card holders are previous long-term temporary. So, somebody comes as a foreign student, finds a job in the United States, and stays based on employment-based immigration. Someone comes as a guest worker, but marries an American and so is sponsored in the family immigration. So, people move from the long-term temporary to permanent immigration often. Very large fractions, sometimes between 40 and 60 percent, of new green card holders are people previously living in the United States. They’re not people newly arrived. There’re about 2 million, based on government estimates, of long-term temporary in the United States. And finally, we have illegal immigration. We think that about 40 percent of immigrants, of the 11, 12 million here, are people who overstayed a visa. The rest are people who snuck into the United States somehow. That 40 percent is not set in stone. We’re not sure exactly how many there are. But that’s around what we think. So this is people who come on a tourist visa and never go home. These are people who come as foreign students and never go home. And then there’s the people who sneak in. The immigration service refers to those as EWI, the people who cross the border. It means entrance without inspection. So roughly we think a 60-40 split in the illegal population. OK. I’d like to go to the next slide very briefly. Talk about the enormous variation on how immigrants do, how fare in the United States. The thing to notice at the far left is that it’s figures on the share with a college degree. We could also look at the share without a high school education. But what stands out is enormous differences between groups. Always remember that. It’s very hard to generalize about the immigration population in that sense. So 80 percent of the immigrants from India have a college degree or more. But that’s only true of 6 percent of the immigrants from Mexico. A majority, or at least half, of the immigrants from Mexico also don’t have even a high school education. They have, like, 10 years of schooling on average. So even if you knew nothing else about those two populations, what would you guess about how they do in the United States – 6 percent college grads versus 80 percent? So very big differences. And, of course, as the rest of the figure shows, enormous differences in socioeconomic outcome. The share in or near poverty is two-thirds or more for immigrants, say, from Mexico and Honduras, but it’s much lower for immigrants, say, from India and Korea – again, often reflecting those education levels. Welfare use tends to be extraordinarily high for some groups – immigrants from Mexico and Honduras, for example. A majority of households with children access one of the welfare programs, particularly the non-cash programs – food assistance, public housing, Medicaid, that sort of thing. So again, very large differences and it’s very dependent on the educational attainment of folks. This is germane to a discussion of illegal immigrants just because we think that illegal immigrants have about a 10th grade education on average. And maybe if you take nothing else from this presentation, there is no possibility that people, as adults, with that level of education as a group – there’ll be all kinds of great failures and successes within that population – but as a group their average incomes will be quite low, the fraction in or near poverty will be high, the fraction, as you can see here from the table, using welfare programs will be high. And it’s true of the native-born population with that level of education. Now, only about 8 percent of Americans don’t have a high school education. Among illegal immigrants it’s probably a majority. But still, the important point here is that if you think that legalizing illegal immigrants is going to be some boon to the U.S. economy, you have to remember what we know about their education levels. There’s no way, as a group, without or without legal status, that as a group they’re going to pay anywhere near enough in taxes to cover their consumption of public services. That doesn’t mean that they don’t work. It doesn’t mean that they’re all lazy. It doesn’t mean that they came to get welfare. It just means that they’re income and tax payments and use of social services will reflect their education levels. And people with that level of education tend to be large fiscal drains, regardless of legal status, regardless of whether they were born in the United States or not. And that’s important, because people will try to convince you it will be a good deal. What the CBO does is they take the illegal population and all the costs that they create now don’t figure at all into their calculation because it’s already there. And all they try to measures is, well, if we amnesty them and we assume – which is a big assumption – they don’t access these programs because they’re not supposed to and things like that, then there might be a small fiscal gain. But that doesn’t mean the illegals are paying anywhere near enough in taxes to cover their consumption, because they ignore all the current costs they create. So the children of illegals in schools and things are just taken as a given. The benefits they get, like food stamps or public housing, are all a given because they exist now. And so that’s the baseline way in which CBO estimates stuff. And that’s one of the problems with their estimation. But remember, people with this education are going to be a large fiscal drain. There’s just no way around it. One other final issue, I guess, I wanted to talk about very briefly – and the congressman did a nice job of summarizing some of my research on this – but this is just on the labor market. You’re going to hear a lot that we are desperately short of workers, that, you know, there’s no one to do – and fill in the blank – to work in your furniture factory in North Carolina or to man your seasonal hotel in northern Michigan or to pick vegetables, or to do any jobs whether it’s nanny, maid or busboy. But the actual data the government collects does not support that. We’ve had about 14 years of wage stagnation for almost every category of workers. As you can see here, the fraction of working-age people holding a job has fallen basically for 14 years – of the native born. And that’s true of high school dropouts the most, but it’s true of people with a high school education. It’s true of those with some college, as you can see here. And even the college graduates, who generally are – do much better, still the fraction of those working at 2007, at that peak, were lower than in 2000. And it’s much lower now. And so what you see on the left here is what the congressman referred to, is basically the native-born have accounted for two-thirds of population growth, among the working age, 16-65, and none of the employment growth, which means there’s an explosion of non-work in the United States. There are 58 million native-born people of working age not working. And that’s about 17 million more than in the past – let’s say, in 2000. So in conclusion, let me just briefly that, you know, immigration is a really big issue that affects a lot of things. And it’s not going to be resolved. There’s no solution. Well, we’ll amnesty and get this issue off the table. That’s silly and stupid. A million new immigrants will be coming each year – assuming we don’t change that policy. There’ll be pressure to let in more people. There’ll be arguments why that might not make sense. We’ll still have temporary visitors. We’ll have all these issues. Immigration is not going away as an issue, ever. There’s nothing that’s going to get it off of the table because it impacts so many aspects of American life. As we discussed, the education level of the immigrants is certainly a key variable in understanding their likely impact and how they’re going to do. Illegally immigrants are overwhelmingly unskilled. So they’re going to struggle, even with legal status. And I tell you who’s really struggling: American workers. There’s been little wage growth and a record number of people are not working. Remember this, when we said unemployment, it only counts people in the survey data who say that they’ve looked for a job in the last four weeks. So if you’re not working and you say you’ve looked in the last four weeks. If you looked in the last five, you drop out of both the numerator and the denominator of that calculation. And what we’ve seen is a massive growth in people who are not working and haven’t looked in the last four weeks. So the unemployment data doesn’t look so bad, but the non-working, the people out of the labor force, is the way it’s technically often referred to, has exploded. I guess in the end, I think as Mark mentioned, we should try not to let special interest and sentimentality dominate our thinking and actually try to base our policy recommendations and formulation based on sort of the national interest. Thanks. Our next speaker got in here in the nick of time. Jessica Vaughan is our director of policy studies and has been really blowing the whistle on the collapse of enforcement, of deportations, of cooperation with state and local law enforcement and what have you. And she’ll be talking about that as well as, maybe briefly, about some of the various guest worker categories that we have. Thank you, all. Good morning. And I apologize for my tardiness. Probably spent more time sitting at the tarmac at National Airport – Reagan National than I did on the plane – it felt like, anyway. That’s an exaggeration. But anyway, as Mark probably told you, I’m the director of policy studies for the Center for Immigration Studies. And I cover most of the operational issues of immigration policy, how the agencies do their jobs, what the effect of policies are on a practical level and particularly immigration law enforcement and the administration of benefits and visas. I got into the immigration issue working as a Foreign Service officer in the State Department many years ago. So I’ve had some practical experience in how the law works and doesn’t work. And so I wanted to give you some background on what the current state of our immigration laws and enforcement are at this point. And I’m going to talk a little bit about immigration enforcement and about how this plays out on a practical level in our communities. Little bit about what happens to the people who are subject to immigration enforcement. And if I have time, maybe talk a little bit about the – how immigration benefits are administered and the importance of fees, which is something that is coming up right now. Immigration enforcement today is most definitely in a state of collapse. Despite the platitudes that you may hear from the Department of Homeland Security, some of their allies in the media about how this administration has brought us smarter and more effective immigration enforcement and that the border is more secure than ever before, those are all really pretty meaningless unless you look at the data on what actually has been happening with respect to people being removed from the country, deportations. And also keep in mind, the size of the illegal immigrant population has not changed much in the last few years. And there’s a reason for that. And the reason is – and I have a lot of this information in the packet back on the table, particularly the publication on the deportation statistics from 2014. In – we are at the point now, in 2014, where ICE is removing half of the number of people from the interior than the agency was doing in 2009. That’s a huge cut in immigration enforcement. Not only are – they are removing fewer criminals as well, criminal aliens, people who are here, either illegal aliens or also legal permanent residents who convicted – been convicted of a crime are subject to removal in most cases. So even though they say they have a focus on felons not families, in fact they’re removing fewer criminal aliens than they have in many years also. The total number of deportations, which includes Border Patrol cases, has also fallen to levels below 2007. And even gang arrests, which are supposed to be a priority for ICE, those have dropped 25 percent in the last couple of years. All of this is happening despite the fact that ICE has more money, more agents and more technology at its disposal, and in particular a program known as Secure Communities, where ICE gets a notice of every person who’s arrested, booked and fingerprinted into a jail in the United States. Those fingerprints are cross-checked with DHS databases. So they get a notification every time an illegal alien is arrested that someone – that they know is an illegal alien. So they have all this – these resources at their disposal, but they’re removing fewer people than ever before. In fact, in 2014, ICE agents identified 585,000 illegal aliens who had been arrested by state and local law enforcement, but they selected only 143,000 of them for removal last year. So there’s tens of thousands of them that they are ignoring, essentially. And the reason is not – that the deportations have declined is not because there are fewer people trying to come here illegally. Of course, we saw last summer, in the surge of families and youths from Central America, that there are more people trying to cross the Southwest border than ever before. We also are – know that there are well over 250,000 people who overstay their legal temporary visa every year. That’s the latest number from 2012. The reason deportations have declined is because of the Obama administration’s policies – generally known as prosecutorial discretion or prioritization are the euphemisms that they’ve given them – that they have been gradually putting in place since about 2009. Starting in 2011, the administration established limits on who ICE agents were allowed to arrest and process for deportation, and they basically said it would only be people who are convicted of a crime, people who had been deported before, people who’d crossed recently or people who had skipped out on their immigration hearings. In 2012, they limited that even further by restricting ICE’s use of something called a detainer, which allows ICE to get a local law enforcement agency to hold an illegal alien to give them time to pick them up. And then, most recently, at the end of November in 2014 with the president’s executive actions, now they’ve essentially said that the only people who will be subject to immigration enforcement are those illegal aliens who have been convicted of a felony or three misdemeanors that are considered to be serious, which does not include identity theft and a lot of other state crimes. So they’ve pretty much given a free pass to virtually every illegal alien who is here who is not convicted of a very serious crime. At the same time, they ended Secure Communities, the very program that would enable them to find out about those illegal aliens who are committing felonies. So they’ve pretty much – you know, they’ve cut off both hands now for ICE. And the public safety impact of this is not theoretical. There is definitely an effect. Many of you may be familiar with the case in California of an illegal alien who killed two sheriff’s deputies outside of Sacramento. That guy, the day before he killed those sheriff’s deputies, if he had been arrested, if ICE had been notified, he would not have been considered a priority for enforcement, despite his 10 arrests for a hit-and-run and other traffic offenses in Utah, despite his prior deportation and so on. He’s somebody that ICE is deliberately taking a pass on. I see this play out near where I live in Massachusetts as well, where we have a gang member, a 21-year-old gang member, arrested for two armed robberies, a total of seven felony counts of armed robbery, that ICE would not issue a detainer on because he had not yet been convicted of those crimes. Under Mass law, he was let out. Then, the next gang street brawl that he was involved in, he fired a gun, the bullet went through an apartment window and killed a woman, mother of three children. So these policies have very real public safety impacts in our communities when ICE does not take advantage of the opportunity to remove people who are already here illegally and involved in crimes by waiting for them to do something horrific. Since the executive action was announced, ICE officers have been ordered to begin releasing people that are currently in their custody, currently in deportation proceedings, and letting them out. Already 600 have been released. They are keeping track of exactly who has been released, so this information can be requested by your offices if you’re interested in who’s being released in your – in the areas that your boss represents. And we know what happens when ICE releases illegal aliens instead of keeping them in custody or removing them swiftly. As we saw with the families and youths that were arrested over the summer, 92 percent of them were released; already 91 percent of them have failed to appear at their immigration hearings. So when you hear the administration say that they’re putting people into proceedings, that means that – usually that they have been released. And another – what is less well known is that, in most cases, these individuals qualify to be issued work permits while they’re here. I just received a response from U.S. Citizenship and Immigration Services about the number of work permits who have been issued – that have been issued in the last few years, and I found that in each of the last three years this administration has issued about 1 million work permits. That is above and beyond people who come in as legal immigrants or who come in on guest worker visas. These are mostly people who are here in the country illegally who are in deportation proceedings, are being allowed to stay here, and often these proceedings take as long as five years. The only way for Congress to address the situation in the short term is to prevent DHS from receiving funds to carry out the president’s plan to issue work permits to categories of people that have not been approved by Congress. And it’s also going to be necessary to have legislation to try to roll back some of the policy changes that have been – and that needs to focus on ending the catch-and-release policies that are in place today, and also cutting off the magnet of jobs that brings people to this country in the first place because right now the word is out around the world that once you make it to the United States, there will be no enforcement action taken against you, that you’ll be allowed to stay. This is not a false rumor; this is, in fact, the policy that has been implemented. So I’ll let Rosemary give you some information on what’s going on on the Hill right now, but happy to take some questions afterwards about any of the details on funding and enforcement and so on. So thanks for coming. MR. KRIKORIAN: Thank you, Jessica. Our next speaker is Rosemary Jenks, government relations director for NumbersUSA. Center for Immigration Studies is a think tank. We don’t have members. We don’t tell people to fax their congressman. We don’t score votes, that sort of thing. NumbersUSA does, and Rosemary is in charge of that effort, is I assume the least favorite person of the Gang of Eight in the Senate as well as many others on their least-favorite lists. But she is going to tell us a little bit about what’s going on, what you guys are going to be dealing with directly in the next few days and maybe few months as well, and sort of give us a trailer or a preview of what’s going on. ROSEMARY JENKS: Well, thank you, Mark. I always have to raise these things. NumbersUSA is basically the organization that legislative correspondents and staff assistants love to hate. Our entire purpose is to connect your constituents with you. So we provide Americans – we have just over 2 million activists on our membership list. We provide them with information about what’s going on up here on immigration and educational information, from the Center for Immigration Studies primarily. And then we ask them to let you all know how they feel about immigration policy, what they want you to do when bills come to the floor. So you will – if you’re not familiar with NumbersUSA, you will soon be because you will be seeing faxes, emails, phone calls coming through about whenever immigration is coming up – and when immigration’s not coming up, we still keep people contacting you because, you know, that’s what our system of government is about. So basically we – as Mark said, we grade each member of Congress based on immigration bill co-sponsorships, sponsorships, and then votes. So we try to grade every vote that impacts the numbers of immigrants, legal or illegal. If it increases immigration, it gets bad grades; if it decreases immigration or increases enforcement, it gets good grades. And we send those grade cards out to your constituents so they know. And there are lots of examples where someone in a town hall meeting waved around a NumbersUSA grade card page and said, why do you have a C? So be ready to look at those grades as votes progress, as bills are introduced, just so that you can make sure that your boss is aware of what may come at him or her. There’s nothing worse than surprising a member of Congress, as you all know. We also send out scoring notices. So if there’s a bill coming up, like there is on the DHS spending bill, we will let you know what we hope that you will do, and you should in fact hopefully have a scoring notice on the two amendments – the two defund amendments that are coming up on the DHS bill in your inboxes already. Those were, I hope, sent out this morning. And this is – you know, we want to give you fair notice on how we’re going to grade any particular immigration bill. So we are, in fact, going to score the votes on the Blackburn amendment that defunds DACA and the Aderholt-Mulvaney-Barletta amendment that defunds the Morton prosecutorial discretion memos and the November 20th executive amnesty actions. You know, Congressman Brooks is right that we have a not particularly visible path to success on this, but it’s very important that you actually pass these two amendments. And the reason is that, you know, as he mentioned there, he wants to do – he wants the House of Representatives to file a lawsuit. Well, NumbersUSA has already funded a lawsuit by a group of ICE agents that was filed right after DACA was first implemented in 2012, and this has been working its way through the courts. About half of the states in this country have filed a lawsuit against the administration for the November 20th illegal actions. If Congress turns around and funds unconstitutional acts, you can’t then go into a court of law and say it’s unconstitutional. Well, yeah, I mean, I know we funded it, but we believe it’s unconstitutional. That is essentially, you know, the idea of dirty hands; you don’t have clean hands if you have actually participated in an illegal act. By funding it, you’re participating in it. So this is a really critical thing. And it’s not just a principle, but as you’ve heard from everybody today, this is about American workers. This is critical. And you know, you all will be getting calls and faxes and emails from your constituents, who are looking at immigration as any other public policy. 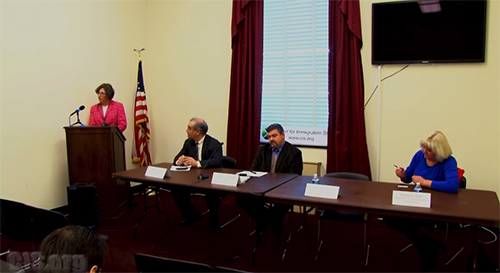 They want an immigration policy that is set in the national interest: What’s best for Americans? You know, it doesn’t matter to them what’s best for Mexico or what’s best for India or what’s best for any other country in the world. You know, we’re a generous and compassionate people, but we care about our families first. So they want to know how immigration policy is going to help, or at least not hurt, them. So they want to know why they’re sitting for hours and hours in an emergency room when their child is sick because there are too many people who are uninsured or are using the emergency room as a doctor. They want to know why their children are in a public school where nobody speaks English. They want to know why their family is surrounded by gang violence. They want to know why they’re paying higher taxes, making lower wages and getting fewer services because our welfare costs have exploded. These are the questions that Americans want answered, and these all are massively impacted by immigration policy, both legal and illegal. You all will have meetings galore with special interest groups, with the Chamber of Commerce, with Zuckerberg, with agricultural groups. All of these people have a point of view, and they have a valid interest. I mean, if you’re an employer and you – you know, you clearly want the cheapest labor you can get. There’s nothing wrong with that. But you, as legislative assistants, you know, as policy people, you need to understand that they have an interest, that they’re going to tell you what – you know, the best arguments for their case. You need to look at the facts. And I’ll tell you, every one of us is more than happy if you dig for the facts, because the facts are on our side every time, every single time. You know, if you look into the data that the high-tech companies provide on their – you know, their supposed shortages of high-tech workers, you will find that that’s not accurate. Are there shortages in specific geographic areas? Perhaps. Does that mean that those companies shouldn’t have to recruit Americans from – you know, if the shortage is in Salt Lake City, shouldn’t they have to advertise the job to Americans in other places around the country so that those Americans can move and take that job rather than being unemployed and on, you know, welfare and unemployment and food stamps and so on? Isn’t that better for the country? So those are the kinds of questions that we really, really hope that you will ask. The other thing, I just want to say what Jessica said about, you know, the massive decrease in enforcement, this is not because ICE agents or Border Patrol agents don’t want to enforce the law. ICE has the lowest morale of any federal agency in the government, and it’s because of this. It’s because they’re not allowed to do their jobs. It’s because they’re releasing criminals and they know it. And they have families, too, that they want to protect, and they can’t because they’re not allowed to. So let’s step back from kind of the politics and let’s think about what’s best for America. How do we solve the problems we have here at home as they relate to immigration? Because I guarantee you you will find the answer is not to give amnesty, the answer is not to increase the number of temporary workers, and it’s not to increase the number of greed card holders or lawful permanent residents. It’s going to be to decrease those, to tailor them to what America needs. So I hope you all will think about that. And I hope that Marguerite will actually send out our contact information to everybody who signed up on the sheet. And I’ll leave it there. Thank you. Thank you, Rosemary. And if anybody has any questions, we would be happy to take questions from anybody on any of these topics or any of the – any topics on immigration they didn’t get to. MS. JENKS: Are there any? MR. KRIKORIAN: Yeah, are there any? Well, no, yeah, there’s plenty of topics we didn’t get to, if anybody has any questions. Yeah, if you could identify yourself, too, your office and everything. Q: I’m James Mazol with Congressman Jim Bridenstine’s office. Question for Steven. Could you talk a little bit more about the refugees and asylees? How many – what are we treaty-bound to accept from a refugee and asylum standpoint? And what do we – what is U.S. policy and things that are related? And also the issue of Temporary Protected Status, which is in the Aderholt bill – not in his amendment, but in his bill, could you talk about that? MR. CAMAROTA: Yeah, sure. I think I’ll let Jessica answer the thing on refugees and asylees, what – you know, what is the treaty obligation. Go ahead. MR. KRIKORIAN: Take the mic closer. MS. VAUGHAN: Sure. First thing to remember is that there’s a difference between refugees and asylees. Refugees are people who are admitted from – directly from their home country or from another place that they have been resettled to temporarily. And those numbers are arrived at according to global needs and in connection with the United Nations High Commissioner on Refugees through, you know, agreed-upon programs that exist worldwide, and we decide how many we can take and they’re resettled through a special program. Asylees are people who arrive here and ask for political asylum, and this is one area of the law where – or one area of immigration that has exploded in recent years, because in 2009 the Obama administration suspended some of the regulations that had been in place for many years to try to prevent people from trying to file frivolous asylum claims in order to be issued a work permit and benefit from being able to spend several years – five years here until their case could be decided upon, and then they can appeal it and so on and so forth. So right now the policy is that people, as soon as they’re apprehended, are allowed to – well, they’re allowed to express a fear of being returned to their home country, and in more than 90 percent of the time the asylum officer or Border Patrol agent or whoever hears that claim, they’re told to accept it. And if people are in detention, there are – the administration has set up what they call “know your rights” presentations, where if they didn’t know to express a fear of return when they were first apprehended, they are informed that that’s an option for them while they’re in detention. And typically they are released and eventually get a work permit. I’m told that in Arizona is one part of the country where they’re seeing a lot of this. They’re getting court dates in about 2020 now for their case to – for their first hearing before the judge before any appeals would happen. So there has been considerable abuse, and we can pretty much trace it to the fact that people are basically allowed to come in and say – you know, make a claim, say I’m afraid to be returned home, even though, you know, they shouldn’t – they’ve come through other countries on their way here, often, particularly in the case of Central America. They’ve come through Mexico and maybe Guatemala and did not make a claim there. They arrive here, we take their word for it and say come back; many times they simply disappear into the woodwork. MS. JENKS: Can I add to that? We have a treaty obligation under the Geneva Convention to have an asylum system, to not return someone to a country where they will be persecuted by the state on the five grounds race, religion, nationality, political opinion and social group. That’s what’s in the – in the international treaty. So that’s our obligation, to not return someone to where they will be persecuted. We do not have an obligation to – an international obligation; we have kind of a moral obligation in some ways – but to take in a certain number of refugees. We have always been very generous in our refugee policy, perhaps too generous. And again, that’s an area where we should be looking at who we’re bringing here and why because the State Department has just committed the United States to taking in 70,000 Syrians over the next five years. These are going to be Muslims because the only people – the only refugee resettlement camps that we’re taking people from are Muslim camps. They don’t allow Christians in, even though Christians are being massively persecuted. So 70,000 Muslims will be resettled in a community near you, and you don’t get any choice. And Americans are not happy about this, because they tend to lump together because once a group is resettled in a particular area they can bring their family members over. We don’t know who their family members are. We don’t have any kind of terrorist or criminal data from Syria. We don’t have the slightest idea who these folks are. All we know is that the U.N. said that they were really nice people. On Temporary Protected Status in the Aderholt bill, what essentially he is trying to do in that bill is limit the president’s ability to continue to abuse the Temporary Protected – Temporary Protected Status program because no country that has been designated for TPS has ever been ended for TPS. None. Not one. Every single country that gets TPS, those nationals are here for decades. And you know, we still have yet to see a program terminated where those folks are actually expected to go home. So this is not a temporary program. You know, Obama could theoretically designate the three Central American countries as TPS, give all those children and family units who came across the border over the summer TPS, and there’s nothing that Congress can do because Congress limited its own ability to control that program, so. MR. KRIKORIAN: Yeah, the – I mean, the TPS thing, the one thing I was going to add is that there actually was one instance of a TPS designation lapsing, which was Liberia, but – after 20 years of constant renewals – but all they did was immediately change the initials from TPS to DED, and they’re all still here anyway. MR. KRIKORIAN: So not a single person who has ever gotten TPS has ever been made to leave because that TPS expired, ever. And TPS was actually designed – Congress invented it in 1990 specifically to rein in the presidents before that who had used various other bureaucratic initials and designations as a way of avoiding enforcement of immigration laws. The problem is that hasn’t succeeded, and so it needs to be tightened up even more because, I mean, frankly, the president could designate Mexico as a – I mean, the Mexicans would have to request TPS, and he could just literally legalize everybody and do it in a lawful way and get away with it, and then where will we be? So any other – any other questions? It’s getting to be – it’s after 10:00 now. I don’t want to – I want to respect people’s time. I appreciate everybody coming. All of our information from the Center for Immigration Studies is online at CIS.org. Numbers is on at NumbersUSA.com. And we’re here to be accosted afterwards, at least I am, a few of us are, if you want to talk. Thank you very much.